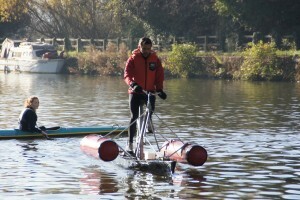 Here are some of Sarah’s video shots from the day of the challenge, and some close-up photos for the bike(/boat) geeks! Thanks to the hospitality and support of the Witt family, I had a fantastic day on the River Thames. I’ll describe the experience in more detail shortly, but here’s a few photos that offer a glimpse of the day. Thank you so much everyone who has sponsored me – the total has already reached a fantastic £600. 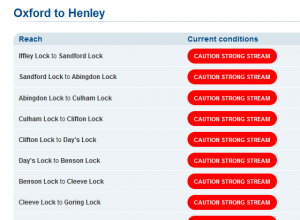 River conditions seem to be improving since yesterday, so Sarah Witt and I have come up to Oxford this evening. Skippy is now ready on the roof rack and I’m setting the alarm clock for an early start. Fingers crossed, everything goes smoothly tomorrow. V nervous! The challenge is on again! Thank you so much to everyone who has already sponsored me in aid of the Ogwen Valley Mountain Rescue Organisation. I’m very disappointed to say that the river conditions mean we’re unlikely to be able to go ahead tomorrow. If so, we’ll try again for Sunday, but if things haven’t improved, the challenge will be postponed until next month. Earlier this year, I had to call on the services of mountain rescue. I love the Emsworth-Basingstoke Relay. It’s 70 km of all the terrain Hampshire can throw at you, right from the coast to within half-a-lunchtime-jog of the Sony office. It’s fab. I’ve done a duathlon and two triathlons so far this year, and this morning (after getting up at 04:45, ouch) did my first open water long swim in many years (I’ve only ever used my wetsuit once before!!) at the Eastleigh lake. Swam for about an hour and managed well over 2 miles. It was murkier but not as cold as I was expecting. This weekend I’m doing the Emsworth-Basingstoke relay (http://www.emsworthrelay.org.uk/) in aid of Alzheimer’s Society. Unfortunately my team has carelessly lost 3 runners (through marathon fatigue, injury, and a surgery brought forward at late notice, respectively) and we’ve only found one replacement, which means the remaining guys are going to have to run nearly 12 miles each, in 4 or 5 short bursts of 2-4 miles with unpleasant opportunities for legs to seize up in between. If you would like to sponsor us in aid of Alzheimer’s Society, it’s http://www.justgiving.com/SonyEmsworthBasingstoke2012. Thank you! After that, I’m vaguely thinking about having a go at a tri with an open water swim (hence the swim this morning), and maybe stepping up to Olympic distance (this being Olympic year and all), maybe at the Bournemouth International race on 8 July. Not sure I can manage enough training but we’ll see. 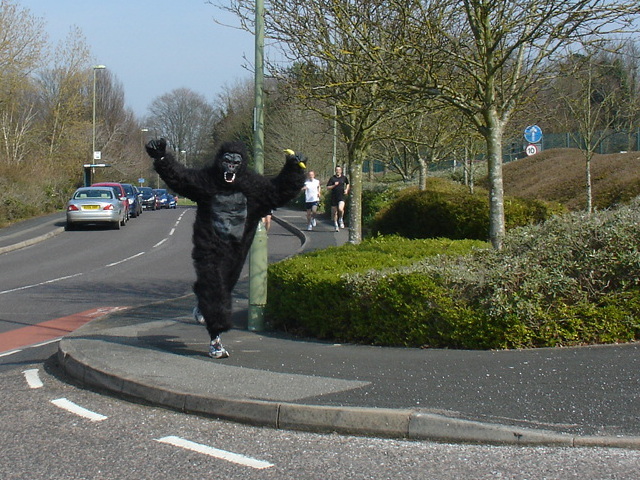 The gorilla, a participant in the very first Great Gorilla Run back in 2003, finished a close(ish) 2nd behind Hannah Oliver. Even better, the event raised well over £100 for the Sport Relief charity.